This is my '06 Harley Sportster Classic 1200. 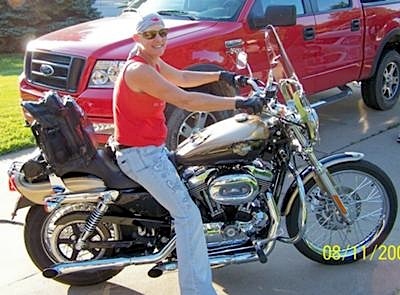 It is the bike I designed while on vacation in Texas on the build your own site Harley provided at the time. I never imagined that my husband would actually buy it for me just as I designed it while messing around on the computer, or that I would ever really ride it. But, I took the ABATE class and the rest is history.....and a lot of fun. I see more and more women riding these days and I hope that one day women can unite in more of one solid group so as to show the number of us that are out there riding and enjoying life. I have the same sportster and I love it. Amazingly enough, my husband bought mine for me too! Happy Trails! Be safe! I love your Custom Sportster, too! I am 56 and just got my first bike. It is a 2009 XL1200 Sportster Low. I love it. After I got it I went on Ebay and started customizing mine. I did get the windshield at the dealership for 1/2 the price as they had a spare. Then I got the detachable sissy bar and pad. I have a taller one and a cute short one. I also got an engine guard. Now I would like to get some bags. I don't know if I want to get the bigger hard bags. I like the look with and without the bags. Maybe just some throw over detachable one?? Anyway - I have really been getting into riding. Definitely scary at first, but with practice... I have been doing really good. Went over 100 miles today and I was really surprised how well I did. Just haven't done the interstate yet. I hate on ramps and still not up to 65 mph. All in time though. Women on bikes really rock!!!! Not bad for a grandma and her first bike!! I will have to do my own page and put on a picture of me and my bike.. I totally agree with you about uniting with more women riders. I rarely see them where I live, and when I am out I turn a few heads because it's just so rare. I feel like other women are missing out on the best experience. Sure, it's scary at first, but it's so worth it once you get on and do it. I love riding. And I hate when I don't get to ride because of rain or something. Right now I have a Kawasaki Vulcan which is a nice ride, but I really want a Harley Sportster like yours. Either the 883 or the 1200. Tell me, what alterations did you do when you built it yourself. I see there's a windshield and a backrest. Anything else? Hey, really nice job designing you bike. It is very nice looking. I also love it when I see other women riders on the road. I wish we had some sort of special acknowledgment hand signal to give each other, lol. Love the bike, and the fact that you designed it yourself is awesome. Keep riding and stay safe!